The screen recording capability comes from what’s called an “entitlement”—a bit of code that app developers can use for anything from setting up push notifications to interacting with Apple systems like iCloud or Apple Pay. This particular entitlement, however, was intended to improve memory management for the Apple Watch. The entitlement isn’t common and would require Apple’s explicit permission to use, the researchers explained. Will Strafach, a security researcher and CEO of Sudo Security Group, said he couldn’t find any other apps with the entitlement live on the App Store. If a user happened to have Lyft installed on their phone too, the entitlement could theoretically be used to monitor how the individual used a competitor’s app—a wild theory, maybe, but not entirely outlandish given Uber’s use of software nicknamed “Hell” to track drivers who worked for both Uber and Lyft. Alternatively, it’s possible that Apple sandboxed the entitlement to prevent it from accessing data outside Uber’s app. Uber says the entitlement was used for something far less nefarious than tracking drivers or surveilling users: improving performance in its Apple Watch app. Strafach noted that he looked for indications that the entitlement had been used maliciously and found none. “Apple gave us this permission years because Apple Watch couldn’t handle our maps rendering. It’s not connected to anything in our current codebase,” Uber’s spokesperson explained. Gizmodo asked Apple about why the entitlement was granted and will update if we hear back. What we do know, though, is that Uber prepared its Watch app within the four-month window and was featured prominently during Apple’s March 2015 keynote about the Watch. 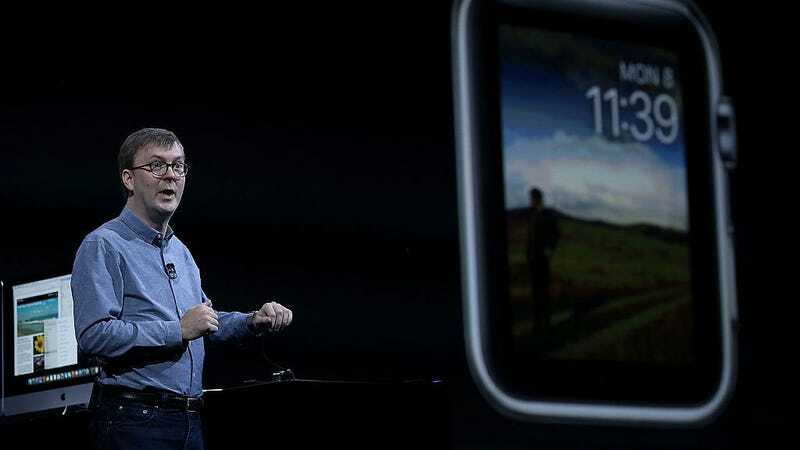 Kevin Lynch, Apple’s VP of technology, demoed Uber’s Watch app onstage, showing how a rider could request a car and track its progress on a map, just as the app would work on the iPhone. Although consumers might be skeptical of Uber’s privacy provisions, the company has a history of collaborating with Apple on privacy. After being wrist-slapped by Tim Cook over its device fingerprinting practices, Uber worked with Apple on the development of DeviceCheck, a fingerprinting tool used to fight fraud. Update 10/6 at 9:45 a.m.: Uber’s spokesperson noted that the entitlement was active only in the 8.2 version of its app. A subsequent update from Apple fixed the memory issue for the Watch, and Uber says the entitlement has been dormant since then.